Another experiment this Ramadan which Alhamdullilah turned out really well. I was planning to make grilled chicken & cheese subway style sandwiches using French bread but the store near my place was out of it. Since I really couldn't change recipes at that time, I decided to just buy multi-grain bread and proceed from there. I was expecting these to just taste like typical sandwiches but baking them in the oven instead of in the toaster oven individually just made them taste so amazing! Not only did the sandwiches stay crisp till dinner-time, but it also saved me the time of toasting them individually. I can so see myself using the same technique and experimenting with the fillings in the future. 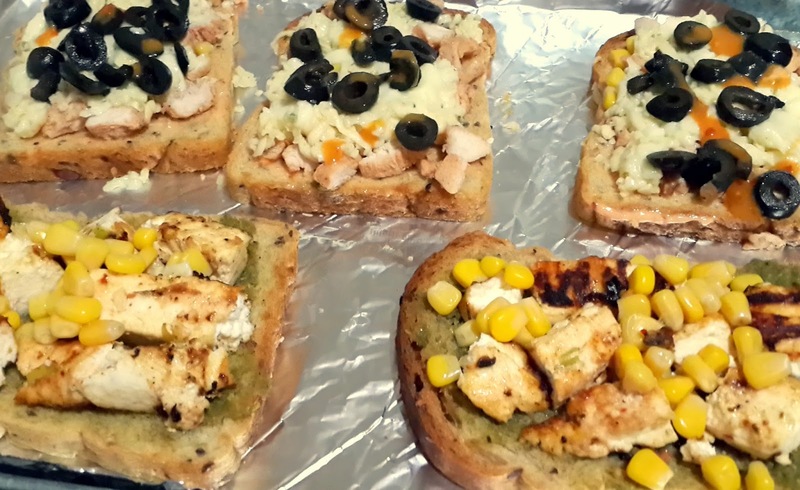 The ingredient list is a bit long, but its simply grilled chicken, cheese & vegetables with mayo & butter as condiments. You can easily substitute leftover chicken if you don't have boneless chicken, or add other vegetables but do make sure you add the cheese. Having this sandwich without melted cheese will just not be the same! I made another version using Paneer & Sweet corn which I will post separately. Other filling suggestions: Caramelized onions, sliced Jalapeno's, Sun-dried tomatoes, Deli Meat, Minced Chicken etc. Melt butter in small saucepan. Add garlic paste/finely minced garlic and saute for 1-2 minutes so that the raw flavor vanishes. Take out garlic butter in a small container and keep aside. Marinate chicken with rest of ingredients and keep in fridge for about 30 minute. Using a pastry brush, brush about 1 tablespoon of oil on a grill pan, and add chicken. Grill for about 10-15 minutes on each side, till the chicken is cooked & the water dries. Slice chicken into small chunks. This was actually quite a lot of chicken - I made about 3 sandwiches, used about 1/2 cup in Cheesy Potato Skins and I had about 1 cup of sliced chicken leftover that I used in white sauce pasta (recipe pending). Mix together mayonnaise, Peri Peri sauce, salt & red chilli flakes. Taste & adjust if necessary. 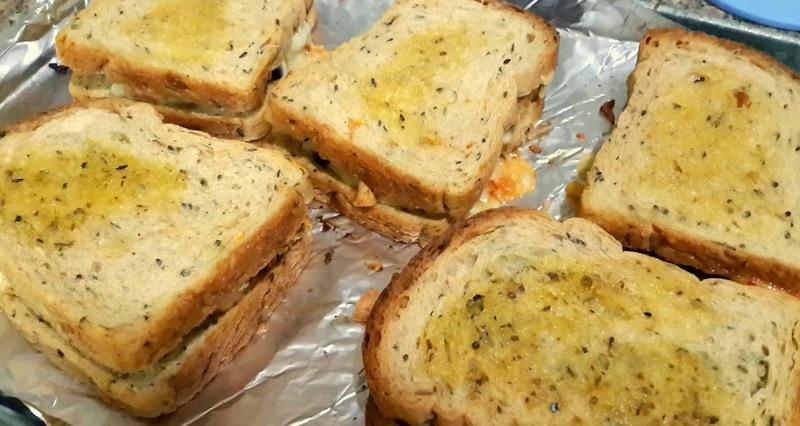 Spread garlic butter on the bottom slices of the bread. Put 4 bread slices on the foil with butter side down. Spread Peri mayo dip on the slices. Add grilled chicken then shredded cheese, then black olives. Top with a little bit of the garlic Peri Peri sauce. Top with bread slices. Brush the top slice of the bread with garlic butter. Bake in oven for about 10-15 minutes till toasted & cheese melts.Cut into triangles & serve with french fries or salad.